More than 250 clinical papers have been published in peer-reviewed medical journals demonstrating EECP/ECP to be safe and effective in the treatment of angina pectoris, congestive heart failure and other cardiovascular diseases. An EECP/ECP therapy system consists of three sets of inflatable pressure cuffs wrapped around the calves and the lower and upper thighs, including the buttocks. In synchronization with each cardiac cycle, obtained with an integrated 3-lead ECG, the cuffs are sequentially inflated from the calves to the buttocks during diastole to produce an arterial retrograde flow towards the aortic root to increase coronary blood flow. This inflation action also increases venous return, increasing blood volume to the ventricles and raises cardiac ouput. The cuffs are deflated simultaneously before the onset of systole, leaving behind an empty vascular space, reducing systemic vascular resistance, and significantly reducing the workload and oxygen demand of the heart. Currently, EECP/ECP therapy is being used as a non- pharmacologic outpatient treatment for patients with chronic stable angina symptoms including chest pain, atypical pain, shortness of breath, fatigue, and cough. EECP/ECP is also commonly used for the treatment of patients with heart failure. It has been demonstrated in the clinical literature to be safe and effective in the treatment of angina, congestive heart failure, peripheral vascular disease, diabetes, cerebrovascular and renal disease and erectile dysfunction. Patients with blood pressure higher than 180/110 mmHg should be controlled prior to treatment with EECP/ECP. Patients with a heart rate more than 120 bpm should be controlled prior to treatment with EECP/ECP. Patients at high risk of complications from increased venous return should be carefully chosen and monitored during treatment with EECP/ECP. Optimizing cardiac afterload reduction and cardiac output may help minimize increased cardiac filling pressures due to increased venous return. Patients with clinically significant valvular disease should be carefully chosen and monitored during treatment with EECP/ECP. 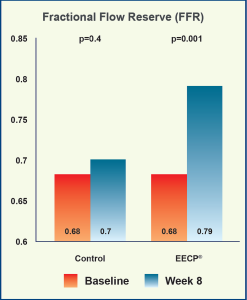 MUST-EECP® (Multicenter Study of Enhanced External Counterpulsation): Effect of EECP® on Exercised Induced Myocardial Ischemia and Angina Episodes. 35 1-hour EECP® treatment sessions were delivered once or twice per day to both the active and the inactive group with appropriate cuff pressure. Significant increase in exercise time post-EECP® from baseline in the active EECP® group (426±20 to 470±20 s, p<0.001) versus inactive (432±22 to 464±22s, p<0.03). However, there was no statistically significant difference between the groups in change in exercise duration from baseline to post-EECP® (active 42±11 vs inactive 26±12 s, p>0.3). EECP® significantly improved time to ≥1-mm ST- segment depression in the active group (337±18 to 379±18 s, p<0.002) compared with the inactive group (326±21 to 330±20 s, p<0.74). There was a significant difference between the groups in the change in time to exercise-induced ischemia from baseline to post-EECP® in the active group (37±11 s) versus the inactive group (-4 ±12 s), p=0.01. Angina episodes per day were 0.72±0.14 at baseline and 0.57±0.38 post-EECP® in the active group and 0.77±0.14 at baseline and 0.76±0.22 post treatment in the inactive group. The difference between the groups was significant with -0.033±0.27 in the active and 0.15±0.27 in the inactive group, p<0.035. Nitroglycerin usage was 0.39±0.11 and 0.56±0.17 at baseline, 0.12±0.04 and 0.43±0.21 post-EECP® in the active and the inactive group respectively. The difference between the groups was not significant, p>0.1. 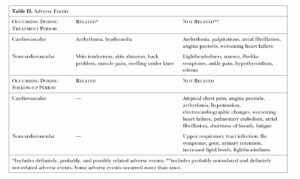 Leg discomfort including pain and abrasion was reported in 11.6±22.7% in the active group, and 4.9±18.7% in the inactive group. MUST-EECP® demonstrates that EECP® Therapy can reduce angina and extend the time to ischemia and increase exercise tolerance in patients with symptomatic CAD. 32 patients enrolled in the study, 11 with idiopathic dilated cardiomyography and 21 with ischemic cardiomyography. Ability to exercise on treadmill, with exertion limited by shortness of breath or fatigue and clinical stability as demonstrated by an absence of medication changes over two weeks prior to the first study visit. Quality of life was assessed using the MLHFQ administered at baseline, again 1 week after the end of the treatment period and after the 6-month follow-up. At 1 week and 6-month follow-up mean exercise duration increased significantly from 637.13 sec to 715.17 sec (change +15.55%, SE+/- 6.53%, min-15.20%, max +81.02%:p=0.028). 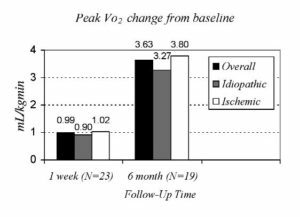 Exercise capacity, as measured by peak oxygen uptake and exercise duration, increased similarly in the idiopathic and ischemic groups. EECP appears safe when applied as adjunct therapy for heart failure. Results of the study warrant the initiation of a randomized controlled study to ascertain the effectiveness of EECP therapy in the management of patients with chronic stable heart failure. Phase I of the International EECP Patient Registry (IEPR) began in January 1998 and enrolled consecutive patient who underwent EECP therapy. Follow-ups conducted at 6-month, 1 year and 2 year. Quality of life assessed by patients using 5-point scales for health status quality of life, and satisfaction with quality of life. Patients interviewed by phone or in person at a clinic visit and data concerning interim clinical events, hospitalizations and current symptomatology were recorded. MACE specified as death, myocardial infarction, percutaneous coronary intervention and coronary artery bypass grafting. 35 1-hour EECP® treatment sessions were delivered once or twice per day to the EECP® group. 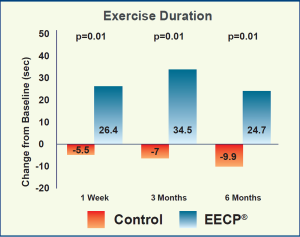 Exercise duration increased by ≥ 60 s in 35.4% in the EECP® group compared with 25.3% in the PT group at the 6-month follow-up visit (p=0.016). Peak VO2 increase by ≥ 1.25 ml/kg/min did not differ between the two groups (22.8% vs 24.1%). 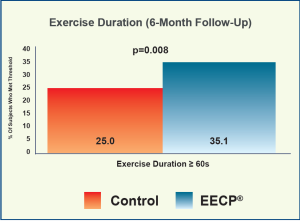 EECP® was associated with a significant increase in exercise duration versus PT at 1-week follow-up (26.4±12.2 vs -5.5±11.7 s, p<0.01), at 3-month follow- up (34.5±13.9 vs -7.0±12.7 s, p=0.014) and at 6-month follow-up (24.7±15.2 vs -9.9±13.2 s, p=0.013) after treatment. 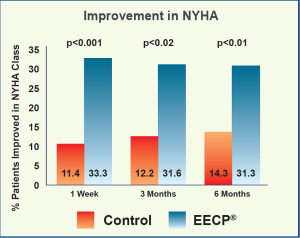 EECP® significantly improved ≥ 1 NYHA functional class with 33.3% of patients vs 11.4% in the PT group 1 week after completion of EECP® treatment, and 31.6% vs 12.2% at 3 month, 31.3% vs 14.3% at 6-month follow-up. 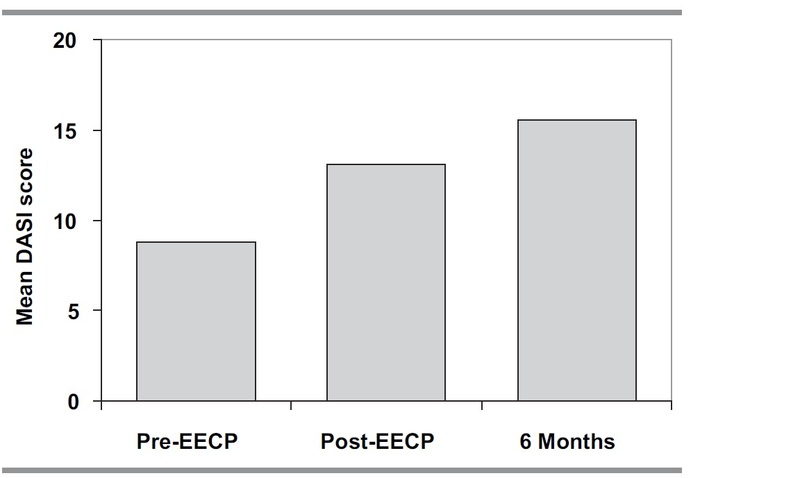 Quality of Life (QoL), assessed by a Minnesota Living with Heart Failure instrument, also improved significantly in the EECP® group when compared with the PT group at the 1-week and 3-month follow-up. However, there was no difference in QoL at the 6-month follow-up. Adverse events occurred in 11.8% of the EECP® group versus 3.2% in the PT group. However, the number of major adverse cardiovascular events (MACE) that occurred during the trial were small and were the same in both the EECP® and the PT groups. 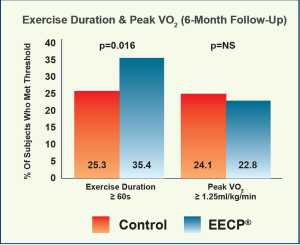 EECP® Therapy improved exercise tolerance and HF symptoms in patients with NYHA class II and III HF, but did not improve peak VO2 6 months after completion of EECP® treatment. In contrast to the overall population in the PEECH trial, the major findings of this subgroup analysis demonstrated a significantly higher responder rate in pVO2 in the EECP® group at the 6-month follow-up when compared with the control PT group (29.7% vs 11.4%, p=0.017). 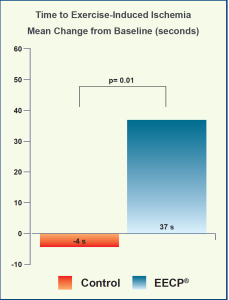 MACE occurred in fewer subjects in the EECP® group relative to the PT group (29.3% vs 36.4%). 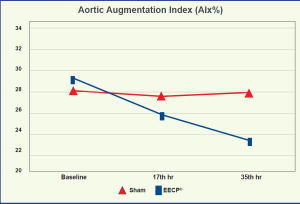 The results of this subgroup analysis indicate that adjunctive use of EECP® Therapy provides functional benefit in older patients with chronic, stable systolic HF in contrast to the overall population in the PEECH study. The EECP® group demonstrated a significantly higher rate of pVO2 improvement than the control group. 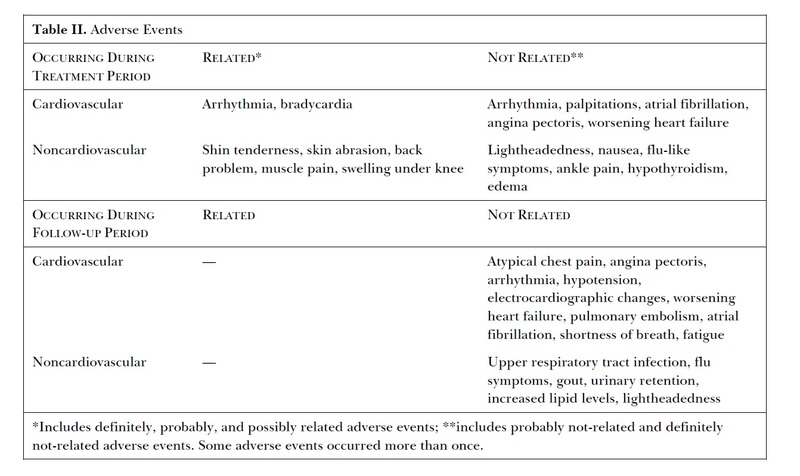 Assess the impact that EECP therapy may have on patients with refractory angina and left ventricular (LV) dysfunction, which has an enormous burden on health care resources (Emergency Department visits and hospitalizations). EECP therapy offers an effective adjunctive treatment for this group of patients and may lessen the healthcare burden that comes with frequent ED visits and hospitalizations. 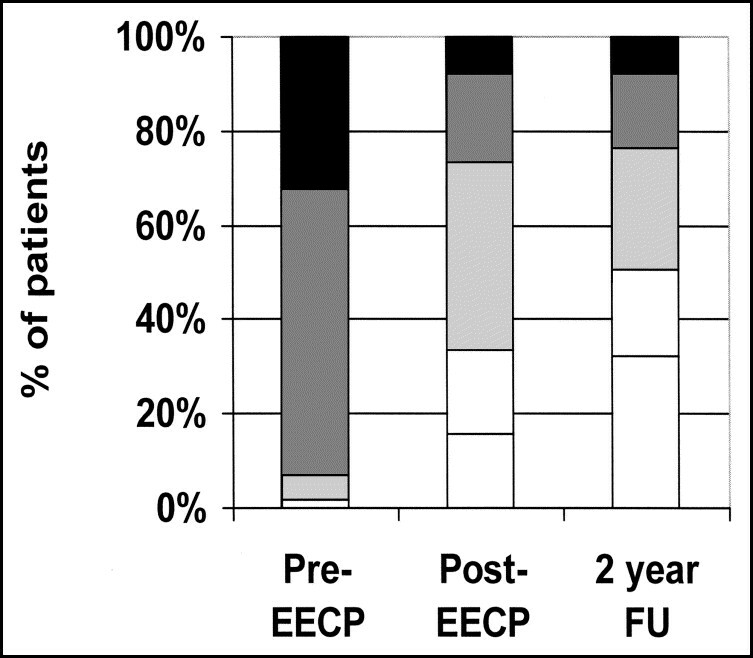 20 sessions of EECP® Therapy over 4 weeks, each session lasting 90 minutes, were performed in 20 chronic stable coronary artery disease patients randomly assigned to the EECP® group (n=10) with 300 mmHg cuff inflation pressure versus the sham control group (n=10) with 80 mmHg inflation pressure. CFI was determined by invasive coronary catheterization pressure measurements and calculated by dividing the mean distal coronary pressure during balloon occlusion by the mean aortic pressure after subtracting out the central venous pressure (CVP) from both. CCC was determined by the ratio of myocardial blood flow to the difference of aortic pressure to distal coronary pressure during balloon occlusion. FMD was determined using 2-dimensional vascular ultrasound imaging. CFI changed from 0.125±0.073 at baseline to 0.174±0.104 at follow-up in the EECP® group (p=0.006), and from 0.129±0.122 to 0.111±0.125 at follow-up in the sham group (p=0.14). 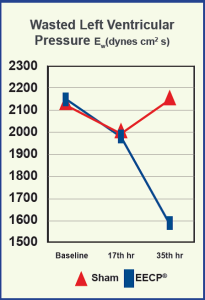 The absolute change in CFI from baseline to follow-up amounted to 0.069±0.128 in the EECP® group and -0.017±0.049 in the sham group (p=0.0009). 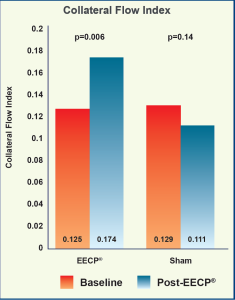 Resting CCC obtained during vessel occlusion changed from 0.365±0.268 at baseline to 0.568±0.585 ml/ min/100 mmHg at follow-up in the EECP® group (p=0.072), and from 0.229±0.212 at baseline to 0.305±0.422 ml/min/100 mmHg at follow-up in the sham group (p=0.45). FMD changed from 4.3±1.5 % at baseline to 6.9±3.5 % at follow-up in the EECP® group (p=0.018), and from 6.0±3.0 % at baseline to 7.6±3.5 % at follow-up in the sham group (p=0.10). 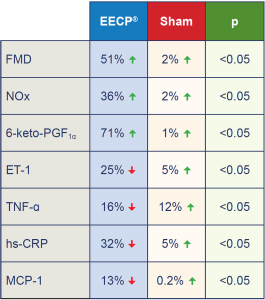 The absolute change in FMD from baseline to follow-up amounted to 1.75±2.8 % in the EECP® group and 0.50±1.0 % in the sham group (p=0.07). 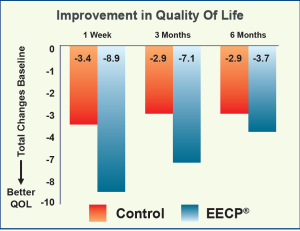 EECP® Therapy appears to be effective in promoting collateral growth. The extent of collateral function improvement is related to the amount of improvement in systemic endothelial function. 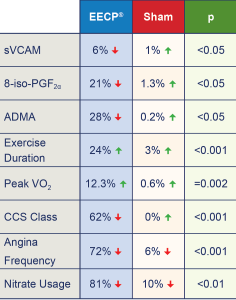 Clinical outcomes: blood pressure, exercise duration, peak oxygen consumption (peak VO2), Canadian Cardiovascular Society (CCS) functional class, angina frequency and nitrate usage. 42 consecutive patients with chronic stable angina were randomized in a 2:1 manner into either EECP® treatment (n=28) with 300 mmHg cuff inflation pressure or sham group (n=14) with 70 mmHg inflation pressure. 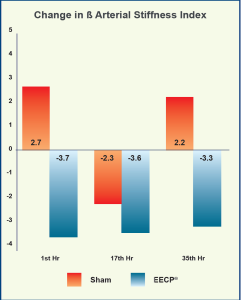 EECP® treatment was given in 35 hourly sessions over 7 weeks. 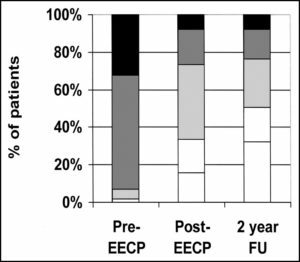 Symptom-limited exercise tests using a modified Naughton protocol were performed by all subjects before and after 35 sessions of EECP®. There were significant improvements in endothelial function, reductions in inflammatory markers and lipid peroxidation in the EECP® group with no significant changes in the sham group. Evidence of improved arterial FMD and endothelial- derived vasoactive agents after EECP® treatment was paralleled by decreased angina symptoms and reduced CCS angina classification from a mean of 3.1 to 1.2 (p<0.001). EECP® Therapy demonstrates in CAD patients to have beneficial effects: improvement in brachial & femoral artery FMD, increases in bioavailability of nitric oxide and PGF1ɑ, decreases in plasma inflammatory and oxidative stress biomarkers. These beneficial changes were in parallel with improvements of clinical outcomes such as a decrease in angina symptoms and an increase in exercise tolerance. 42 consecutive patients with chronic stable angina were randomized in a 2:1 manner into either the EECP® treatment group (n=28) with 300 mmHg cuff inflation pressure or the sham group (n=14) with 70 mmHg inflation pressure. All data was taken at baseline within 1 week before EECP® treatment, then at the 17th hour and at the completion of 35 hours. Assessment of arterial wave reflection was performed with the SphygmoCor system recording peripheral pressure waveforms using applanation tonometry with a high-fidelity micromanometer. Results of the peripheral measurements were used to generate the corresponding aortic waveform using a generalized transfer function. A SphygmoCor Pulse Wave Velocity Vx system was used to measure PWV at 3 sets of sites sequentially: carotid- radial, carotid-femoral and femoral-dorsalis pedis. Central PWV was evaluated using the carotid-femoral data and peripheral PWV using the femoral-dorsalis pedis and carotid-radial data. 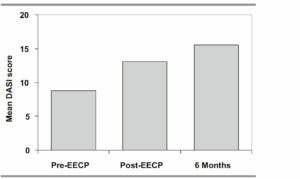 Symptom-limited exercise tests using a modified Naughton protocol were performed by all subjects before and after 35 hours of EECP® treatment. 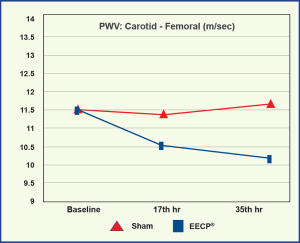 Carotid-femoral PWV was decreased at the 17th hour (10.6±0.4 m/s) and post-EECP® (10.2±0.4 m/s) compared to baseline (11.5±0.5 m/s), both p<0.01, while there were no changes in the sham group. 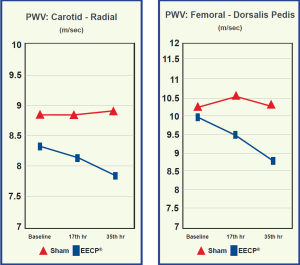 PWV in the Carotid-radial (7.8±0.3 vs 8.3±0.3 m/s, p<0.01) and femoral-dorsalis pedis (8.7±0.4 vs 9.9±0.4 m/s p<0.05) were significantly decreased post-EECP® compared to baseline, while there were no changes in the sham group. 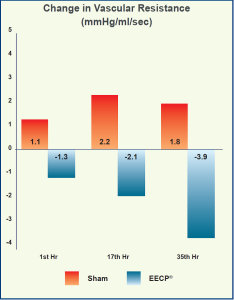 EECP® produced a progressive decrease in Alx of 25.8±2.7% at the17th hour and 23.3±2.7% at the 35th hour compared to 29.1±2.3% at baseline (p≤0.01) while there were no changes in the sham group. 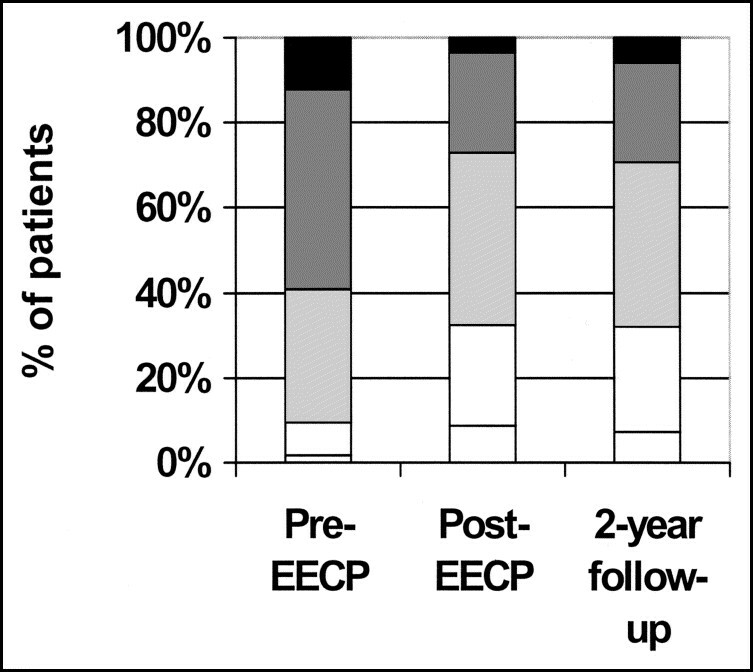 There was a substantial decrease in wasted left ventricular pressure energy after 35 hours of EECP® treatment compared to baseline (1,598±233 vs 2,167±372 dyne/cm2/s, p<0.01). 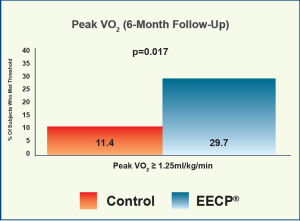 EECP® treatment led to progressive increases in pVO2 from 17.0±1.3 at baseline to 18.4±1.4 after 17 hours and 19.4±1.5 ml/ kg/ min at 35 hours; while there were no changes in the sham group, 16.5±1.3, 17.0±1.4 and 16.6±1.4 respectively. 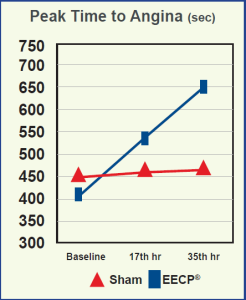 Total exercise duration group from 586±41 at baseline to 678±52 after 17 hours and 774±65 sec after 35 hours while there were no changes in the sham group. 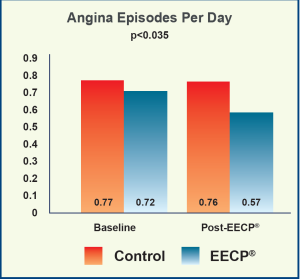 Peak time to angina increased significantly in the EECP® group from 406±39 at baseline to 537±48 after the 17th hour, and 645±64 sec after the 35th hour, while there was no change in the sham group (449±54, 466±52 and 471±53 sec respectively). There were statistically significant decreases in CCS class from 3.2±0.1 at baseline to 2.4±0.1 after 17 hours and 1.2±0.1 after35 hours, while there were no changes in the sham group (2.9±0.1, 2.9±0.1 and 2.9±0.1). 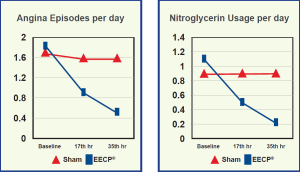 There were also statistically significant decreases in the average angina episodes per day and nitroglycerin usage per day in the EECP® group while there were no significant changes in the sham group. EECP® Therapy decreases central and peripheral arterial stiffness, which may explain improvements in myocardial oxygen demand in patients with chronic angina pectoris after treatment. These changes were parallel to improvements in clinical outcomes including exercise tolerance, peak oxygen consumption and angina functional class. 23 patients with angiographic narrowing of >70% in at least one coronary artery assessed by FFR<0.8 were randomized in a 2:1 manner to 35 hours, 1 hour daily, 5 hours per week for 7 weeks active EECP® treatment (n=16) or to the control group (n=7) with 7 weeks, 5 times per week walk-in appointment for non-therapy related diagnostics, nutrition-counseling. Cardiac catheterization with hemodynamic measurements of aortic pressure (Pa), central venous pressure (Pv) , mean distal coronary pressure (Pd) and coronary wedge pressure (Pw) were measured with a balloon occlusion proximal to the coronary stenosis. A symptom-limited bicycle ergometric test was performed at baseline and at the 8th week starting with 25 or 50 Watts and continued with an increase of 25 Watts every 2 minutes. CCS and NYHA were evaluated before the invasive procedure at baseline and at the 8th week. CFIp defined to be the ratio of (Pw-Pv) to (Pa-Pv) increased from 0.08±0.01 to 0.15±0.02 (p<0.001) in the EECP® group while there was no significant change in the control group (0.15±0.03 to 0.14±0.02 (p=0.7). The FFR changed from 0.68±0.03 at baseline to 0.79±0.03 at follow-up in the EECP® group (p=0.001), with no change in the control group from 0.68±0.06 to 0.7±0.05 (p=0.4) at follow-up. A significant reduction in CCS classification was achieved after EECP® treatment (p=0.008) whereas in the control group no change was observed (p=0.25). The severity of dyspnea as measured by NYHA classification was reduced after EECP® (p<0.001) but not within the control group (p=0.28). 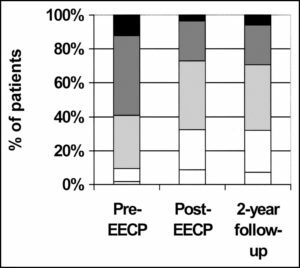 At the end of therapy, 81% of the EECP® group were free of angina pectoris compared to 56% at baseline, and in the control group, only 14% improved after 7 weeks. No MACE occurred during the study. This study provides direct functional evidence for the stimulation of coronary angiogenesis via EECP® in patients with stable CAD. 55 subjects, 25 asymptomatic with high cardiovascular risk (HCVR) and 30 with angiographically proven coronary artery disease (CAD), were randomized to sham EECP® treatment (n=28) with less than 75 mmHg applied to cuff inflation with the remaining 27 subjects enrolled in the active EECP® group with 300 mmHg inflation pressure. Blood samples were collected before and after 1 hour of active or sham EECP® treatment and plasma and platelet cGMP levels were measured by radioimmunoassay. 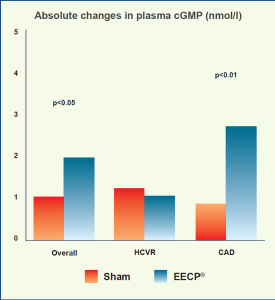 Absolute changes in plasma cGMP doubled in CAD subjects undergoing active EECP® treatment compared with sham control (p<0.01) by 235% in active EECP® CAD patients but not in the group with HCVR. Application of 1 hour of active EECP® treatment significantly increased platelet cGMP content by 19% (p<0.01) in the overall population (CAD+HCVR) but not in the sham group. 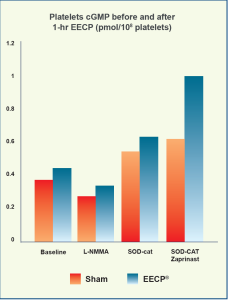 EECP® significantly increased platelet cGMP compared to their respective baseline values (by 22% for L-NMMA, by 21% for SOD with catalase, and by 63% after inhibition of phosphodiestarase 5, all p<0.01). The counterpulsation induced cGMP increase was twice as large in subjects receiving active EECP® treatment versus those serving as a sham group. EECP® increases platelet cGMP content, which suggests nitric oxide synthase activation. EECP® increases cGMP production which may be the mechanism by which EECP® exerts its clinical benefit. Analysis of the modulation of platelet cGMP content suggests EECP® activates the nitric oxide-dependent pathways. 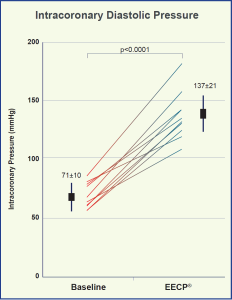 30 patients with stable coronary artery disease (CAD) demonstrated by angiographic proven stenosis greater than 50% in at least one major coronary artery or a documented MI treated according to medical therapy guidelines were randomized in a 1:1 manner into either EECP® treatment (n=15) with 300 mmHg cuff inflation pressure or sham group (n=15) with 75 mmHg inflation pressure. All data was taken at baseline within 1 week prior to EECP® treatment, then at the 17th hour and at the completion of 35 hours, 1 hour daily for 7 weeks. Echo-Doppler studies were performed with a high- resolution ultrasound imager on the right and left common carotid arteries with a 7.5 to 12 MHz probe. The ß stiffness index calculated by ln(Ps/Pd)/ DD, where Ps and Pd are the systolic and diastolic blood pressure and DD is the ratio between carotid pulse and diastolic diameter. Carotid vascular resistance was calculated as the ratio between mean arterial blood pressure and mean blood flow (mmHg/ml/sec). The ß stiffness index was significantly reduced at 1 hour (-3.7, p<0.01), 17 hours (-3.6, p<0.001) and 35 hours (-3.3, p<0.01) in the active EECP® group, and this decrease was statistically different when compared with the sham group at 1 hour and 35 hours (p<0.05 respectively). Carotid vascular resistance was concomitantly reduced in the active EECP® group at 17 hours (-2.1 mmHg/ml/ sec, p<0.05), and 35 hours (-3.9 mmHg/ml/sec, p<0.01), while there was an increase in the sham group showing a significant difference between groups at 17 hours (p<0.01) and 35 hours (p<0.001) respectively. One patient with worsening arrhythmia withdrew from the sham EECP® group after 17 hours. No other major complications occurred. EECP® exerts clear vascular relaxation effects on both large and small arteries of carotid circulation. 10 outpatients referred for diagnostic cardiac catheterization with suspected coronary artery disease (n=5), severe mitral regurgitation (n=3), and prior orthotopic heart transplantation (n=2) were studied with measurement of the central aortic pressure, intracoronary pressure and intracoronary Doppler flow velocity with a sensor-tipped transducer and guidewire. No MACE was reported during the study. EECP® significantly decreases aortic systolic pressure to reduce the workload of the heart, resulting in decreased myocardial oxygen demand. EECP® significantly increases aortic and intracoronary diastolic pressure, thereby increasing intracoronary blood flow, augmenting energy supply to the myocardium. IEPR I and II were organized to document the patterns of use, patient characteristics, safety and efficacy of EECP® during the treatment period and long term follow-up for a period of 3 years post treatment. IEPR data was collected by the Epidemiology Data Center of the University of Pittsburgh. Entry criteria: consecutive patients gave consent and underwent at least 1 hour of EECP® treatment. 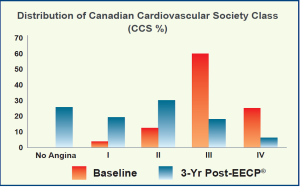 At baseline, 86% of the 7,973 CAD patients were in Canadian Cardiovascular Society (CCS) angina class III and IV. 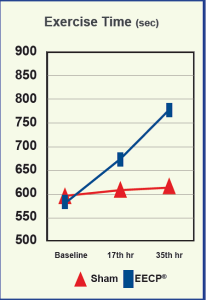 At the 6-month follow-up after EECP®, 25% of the 4,565 patients were in CCS class III and IV. 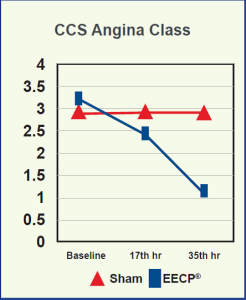 76% of patients improved their CCS angina status by at least 1 class. At 3 years follow-up, there was a reduction in CCS Class of at least 1 class in 78% of the patients, and by at least 2 classes in 38%. This was sustained in 74% of the patients during follow-up. 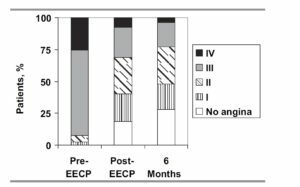 The frequency of angina reduced by 4-6 episodes per week immediately post-EECP® and this was sustained at the 3 year follow-up. During EECP® treatment, 1.5% experienced musculoskeletal discomfort, 2.5% skin breakdown, 2.2% heart failure exacerbation, 4.5% unstable angina, 0.8% MI, 0.8% PCI, 0.6% CABG and 0.5% death. Cumulative 3-year mortality was 17%, MI was 11.8%, and MACE was 40.8%. There were 2,917 patients enrolled in IEPR-II. 450 had refractory angina with LV dysfunction (LVEF≤40%) and complete data on emergency department (ED) visits and hospitalizations 6 months before EECP® treatment. 93% were in CCS class III and IV, 50% had history of heart failure (HF), mean LVEF was 30±8%. 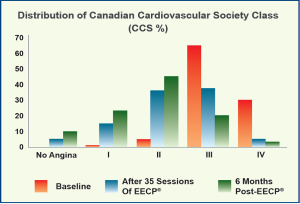 After completion of EECP® treatment, angina class decreased by at least 1 CCS class in 72% of the patients, 19% reported no angina and 2% had an increase in angina class. 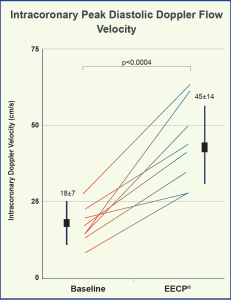 Mean angina frequency decreased by 7±14 episodes per week from 11.4±16.9 to 3.8±10.9 (p<0.001). The mean number of ER visits per patient decreased from 0.9±2.0 during the 6-month period pre-EECP® to 0.2±0.7 during the 6-month period post-EECP® (p<0.001). 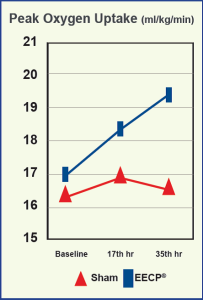 The mean number of hospitalizations reduced from 1.1±1.7 during the 6-month period pre-EECP® to 0.3±0.7 during the 6-month period post-EECP® (p<0.001). MACE occurring during EECP® treatment was 0.7% MI, 0.2% CABG, 1.2% PCI, and no death for a total MACE rate of 1.8%. Heart failure exacerbation was reported in 2.6% of patients. 6 months after completion of EECP® treatment cumulative mortality was 5.3%, MI was 1.9%, and MACE was 10.6%. EECP® used in everyday clinical practice without the constraint of trial inclusion and exclusion criteria demonstrated improvement in angina class in 74% of the treated patients and these benefits were sustained for up to 3 years. 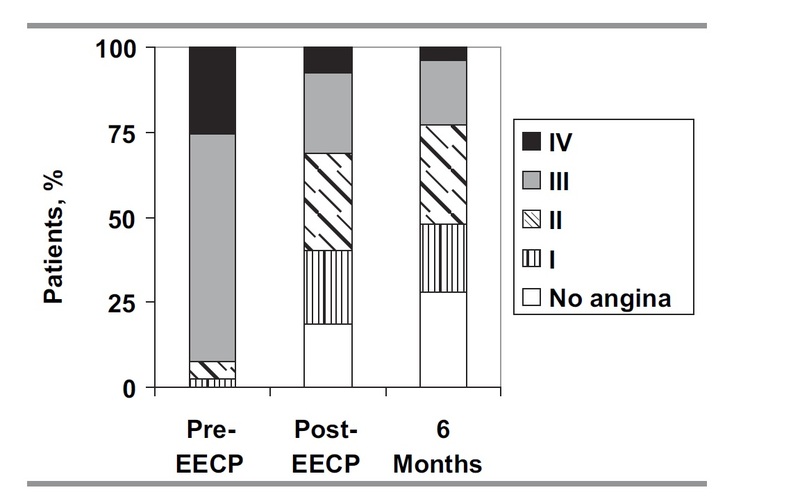 Similarly, EECP® reduced the number of angina episodes. 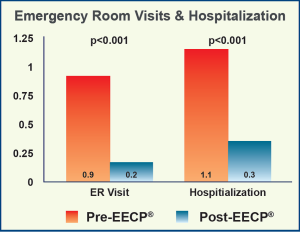 EECP® Therapy was cost effective in reducing the number of emergency department visits and hospitalizations.